Brakes are one of the top safety features in any vehicle, providing the driver with the control to slow the tires down and stop moving. Malfunctioning brakes are extremely dangerous. Proper maintenance is critical, especially because brakes are used every time a vehicle moves, and every time it’s parked. Brake systems consist of a series of parts that work together to create friction, slowing down the wheel, and ultimately, the entire vehicle. When you step on the brake pedal, you allow brake fluid to travel to the calipers, which squeeze the brake pads so that they rub against the rotors. The rotors spin with the tire, and the friction created between the brake pads and the rotors slows the tires down. Each piece of the brake system, from the brake lines and fluid to the rotors and brake pads, need to be functioning properly in order for the brakes to work correctly. Even though friction is necessary in the brake system, the heat created by that friction is detrimental to the brakes. Because the brakes are used so often, they do tend to wear out, and they will need to be replaced regularly. Brakes are designed to wear out safely, but things like unbalanced tires, misaligned tires, rough roads, and excessive speeds can cause them to wear unevenly, requiring faster replacement. How do I Maintain my Brakes? 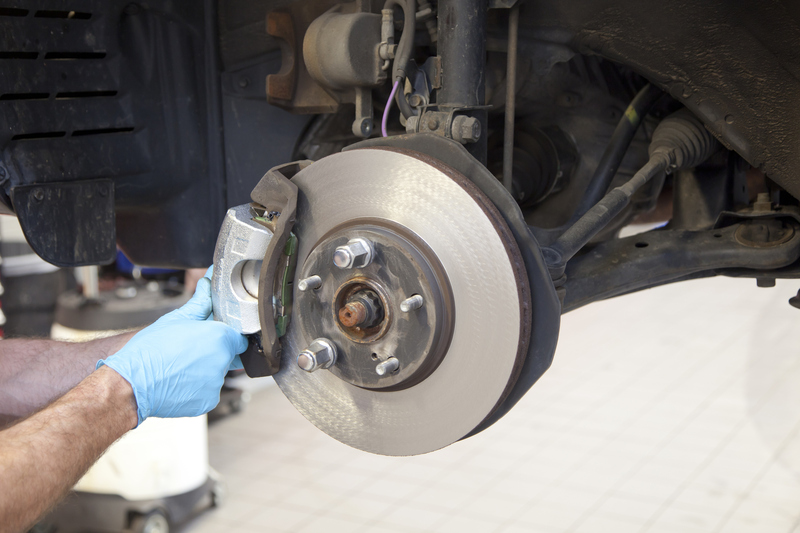 Brakes need to be maintained on a regular basis, usually, at least once a year. However, how often you drive, the way you drive, the way you maintain your vehicle and your tires, and the length of time you leave your car sitting, unattended, can all affect how often you need to have your brakes replaced or inspected. Brake pads generally need to be replaced more often than any other piece of your brake system. As you brake, your brake pads rub against the rotors, and over time they become thinner. As they become thinner, you’ll need to press harder on the brake pedal to stop your vehicle – a sign it’s time for new brake pads. If your brakes begin to squeak, you may have worn the pads or a portion of the pads, completely down, so that the metal behind the brake pad is rubbing on the rotors. Rotors and calipers are designed to last longer, but may need to be inspected and replaced as well. Your technician can let you know during your brake inspection if these parts are in good condition.